Oh my lamb. Mary had a little lamb! Lamb. We don't mind. We sometimes take a break from mutton which of course is forever our favorite (Devil's Curry & Easy Mutton Curry). Then again, lamb sort can be the substitute as well. Actually, come to think of it, we are not really particular. Lamb usually the call for curries (Lamb Rogan Josh & Lamb Kofta Curry), of course every now and then, me and my thinking cap for a different kinda lamb dish (Malaysian Lamb Stew & Lamb Fried Rice). In fact, I can proudly say that lamb has been the star ingredients for other dishes as well (Lamb Pho & Lamb Burgers). And right now, lemme introduce to you Lamb Spaghetti. Not to say there are not other lamb spaghetti recipes, but this one, is my Malaysian Asian version (Shrimp Pho). My style, my way, my food story and my dish for my convenience. 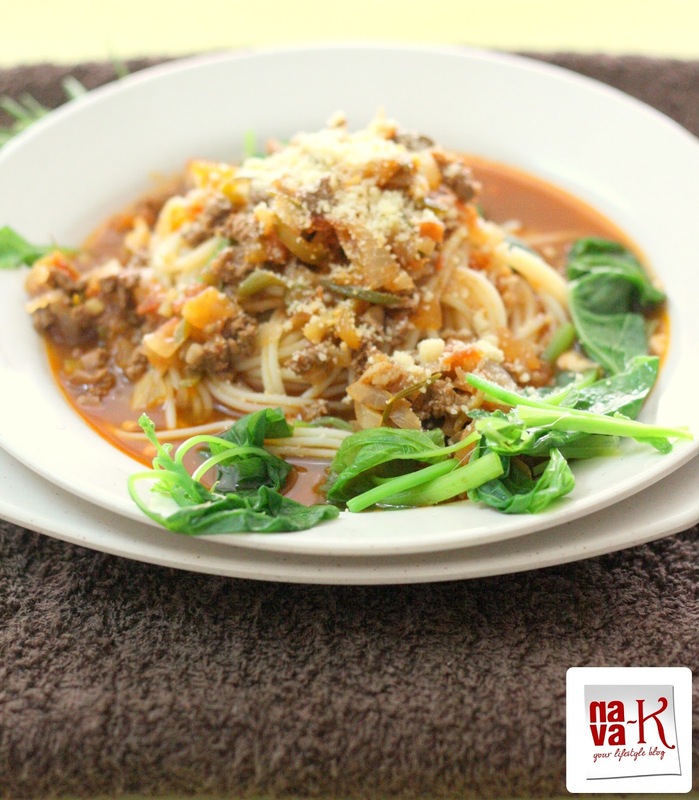 Spaghetti and spinach in a scented by bay leaves and fresh rosemary sauce, a tiny bit of spiciness from paprika and cheese atop. A winner? Would you agree or you don't? Yeh or neh? Heat oil and when heated, sauté onion, ginger and chilies. Add minced lamb, bay leaves and rosemary. Stir to break up lamb (about 3-4 minutes). Add chopped tomatoes and stir. Note: if you like more gravy, pour some water. Season with paprika and salt. When the sauce starts to simmer, remove from heat. 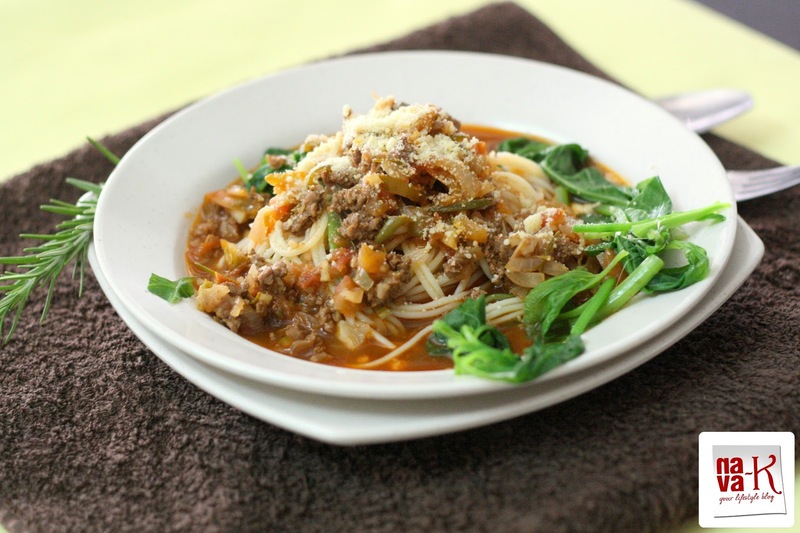 Place spaghetti and spinach in a serving plate. Pour sauce over and sprinkle with cheese. Wow, loved this sphagetti.This has lamb, spinach and everything, which, with your unique culinary touch, transpormed into a great dish! Spinach spaghetti looks really yumm Nava, you made unique combo. A combination of my 3 fave ingredients. Never made pasta with spinach...I think I will try it soon! I haven't attempted a spaghetti dish wit lamb gravy but it looks interesting ,though.